32 x 41 mm 18K rose gold case , reverse tonneau shape, 9.6 mm thick, sapphire back skeleton, 600S manual movement with power reserve indicator and flying tourbillon, approximately 40 hours of power reserve, brown alligator strap, folding buckle. Water resistant to 03 ATM. 32 x 41 mm 18K white gold case set with 151 cut diamonds (approx. 2.4 ct), 9.6 mm thick, sapphire back gem set skeleton, diamond bezel, gem set dial, 600D manual movement with seconds, hours, minutes and flying tourbillon, approximately 40 hours of power reserve, black alligator strap, folding buckle set with 26 diamonds (approx. 0.4 ct). Water resistant to 03 ATM. 32 x 41 mm 18K rose gold case set with 151 cut diamonds (approx. 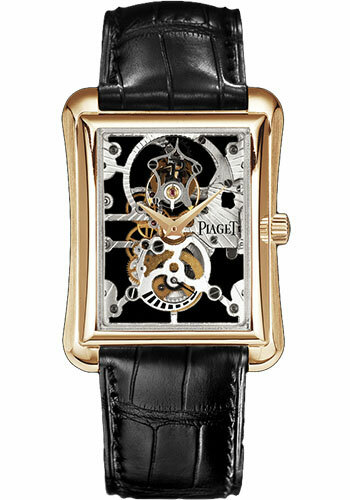 2.4 ct), 9.6 mm thick, sapphire back gem set skeleton, diamond bezel, gem set dial, 600D manual movement with seconds, hours, minutes and flying tourbillon, approximately 40 hours of power reserve, brown alligator strap, folding buckle set with 26 diamonds (approx. 0.4 ct). Water resistant to 03 ATM. 32 x 41 mm 18K white gold case set with 171 diamonds (approx. 2.1 ct), 9.6 mm thick, diamond bezel, gem set dial with 389 diamonds (approx. 1.1 ct), 530P automatic movement, approximately 40 hours of power reserve, 18K white gold bracelet set with 569 diamonds (approx. 18 ct), integrated buckle. Water resistant to 03 ATM.